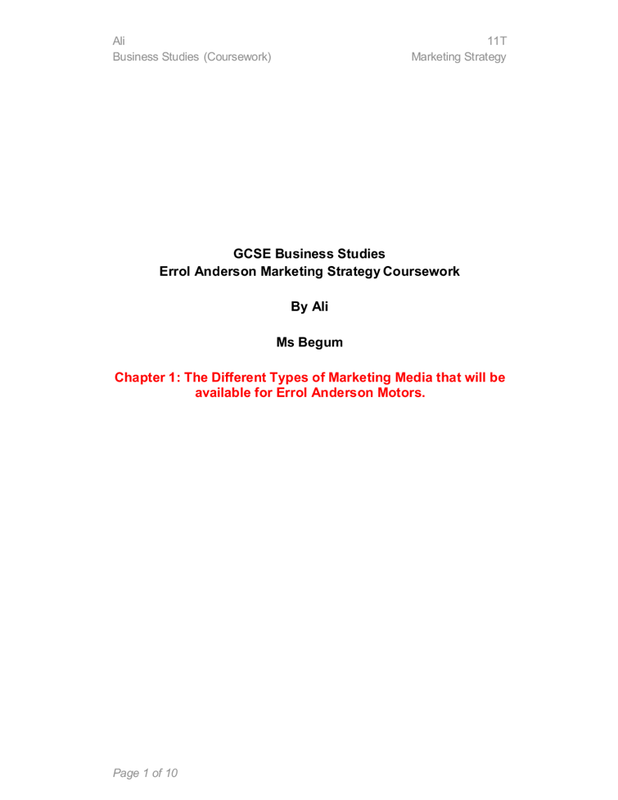 Chapter 1: The Different Types of Marketing Media that will be available for Errol Anderson Motors. Marketing Media which is also known as advertising media is media which can be used to advertise. These include Television, billboards, radio, cinema, internet, directories and a lot more. 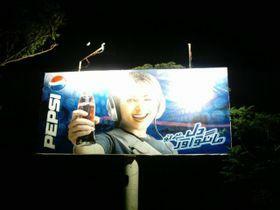 There are 4 types of Advertising Media; visual, audio, printed and outdoor. Businesses have a wide range to choose from. Some are expensive and some are cheap. Some are seen by hundreds of millions (like sponsoring the world cup) and some are seen by a few dozen (leaflets). There is no best advertising media in general because every company has a different budget and different target audiences. Although all these types will bring attention, they are not all appropriate. For example sponsoring Manchester United will probably make Errol Anderson Motors read by millions, but it will be very expensive and the millions that will see it are not all potential customers because they live in different parts of London, different parts of England and different parts of the world. This is an example of Inefficient Media. Efficient Media is when the money paid is as little as possible while getting maximum potential customers. For example if you pay a billion pounds for a billion people to see the advert of sponsoring a football team, only a few hundred live around the business area so you will be paying a billion pounds for a few hundred potential customers. But giving leaflets to cars driving around the garage would mean that you are paying less for each potential customer to see the advert. Radio – Radio is a cheaper way to advertise to a lot of people. There are a lot of stations so the appropriate target can be chosen. Another advantage is that you can submit the advert to an FM radio station which is only accessible in London. Radio is usually heard by car drivers which are the main potential customers for a garage. A disadvantage is that you will be paying for everyone in London to listen to the advert which is only suitable for the north west of London or Harrow only. Radio also has no graphics and information is only heard and nothing is usually jotted down, so the address needs to be described and the features need to be said in a nice manner (whereas in TV you can put some information as pictures and writing). A person listening to his radio may only be interested in music (or dialogue in a chat show). The point is most radio listeners are not listening for adverts but rather for content. A radio advert is socially accepted and most have no objection to it (it does not affect the environment etc.). A radio advert is also very professional and people are impressed by them. Errol Anderson can advertise his business to a wide range of people through this inexpensive mean professionally but is not very useful because although there are a lot of listeners for a relatively cheap amount of money, most listeners will not be able to reach Errol Anderson Motors because they live away from Harrow. This is however very useful if Errol decides to open new branches around London. The In-depth information is below. Posters – Posters are cheap and can be placed only around the area of the garage which would mean you wouldn’t be paying for impressions from people which are far away from the garage. The bad thing about posters is too many would be unprofessional and people see this as wasting paper and morally wrong which would affect the customers view on a Errol’s business. Posters are usually ignored but there are some viewers which make this type of advertising good value. These can help Errol get some customers without paying too much, but will not really effect his business success. The In-depth information is below. Leaflets – Leaflets can reflect Errol’s business. 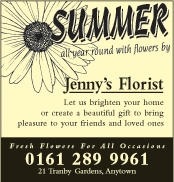 A well designed leaflet can get customers (especially with the right promotion e.g. a coupon). Leaflets are a more expensive method [than Posters] of advertising but a person who receives a leaflet will feel more valued. This is similar to the poster advertising where moral issues can be caused (especially about wasting paper). This can help Errol drive some customers to his business. The In-depth information is below. Directories – Directories like the well-known ‘Yellow Pages’ are used by many know and listings are quite cheap. Errol can use this as a long term way of having an easy method for potential customers to look for him. The In-depth information is below. Regional/Local Newspapers – Newspaper listings are read by many and advertising on a local newspaper gives a good image for the garage. Errol can use this to gain an image to start his business and get some customers. The In-depth information is below. Internet – Internet marketing is a new marketing world. It is a cost-efficient way and a lot can be done. It can have a whole booking and availability system or just an address and a map on how to get there. Errol can use the internet as a long term means which can help him communicate with customers or expand the business as well as advertise to customers at targeted sites. The In-depth information is below. ‘BB1’, ‘BBC2’, ‘ITV’ and ‘Channel 4’ have regional differences. This means the adverts shown in London are different to those shown in Manchester. Although some Television campaigns are aimed to advertise to all regions only ‘five’ has the same broadcast in all regions. ‘BBC’ Channels 1 and 2 do not provide service for advertisers so they will not be part of the research. Television is watched by millions each day. By midnight around 85% of adults have watched TV (estimate by ‘ITV’) which shows a large interest in television. Typically for a 30 second advert in London’s ITV1, it would costs £2,884 at around 11am (Trisha) and the same advert would cost £29,575 while Coronation Street is on. The price of an advert, in the commercial break of ‘Trisha’, could be considered good value with the amount of viewers, but most of the viewers are not potential customers. They do not live in the same area as Errol Anderson Motors and not all of them are car owners. Also, the price above is only for broadcasting a commercial. An advertiser would need special recording equipment, actors and a well though script to have any success. This would add on anything between £10k and £40k, but this is regarded as a one-off fee and the advert can be used many times without having to pay this great cost. Television is also good in that it has a lot of programs to choose from in which you can advertise. Other businesses in the same marketing segments have used this media to advertise their service like . Kwik-Fit has gained an excellent image of professionalism. The difference between Errol Anderson Motors and Kwik-Fit is the size. When Kwik-Fit advertises, branches from all over London are advertised for the same cost. This is a key benefit of being a franchise. They also have a great capital and a lot of experience as their company has been around since 1971. The summery is that television advertising is not suitable for Errol Anderson Motors; because it needs a greater capital and only a small faction of the viewers of television are potential customers even though the advert can be chosen to be shown in the commercial break of a program that is to do with vehicles. If the advertising campaign is an immense campaign to make an image for the business, it could be successful, but it needs a lot of capital and with only one store across London, it will not be an efficient campaign. The cost is variable with the program but usually between £3000 and £30000 and is not efficient for Errol. This is because Errol Anderson Motors is not a large company and is mainly used by the people who live in one area of London (whereas the adverts will be shown to the whole of London or the UK). Can be very persuasive if used well and can show a lot of animation and information as text. Some information like website address, phone number and address need to be accurate so it is better shown in writing than it is spoken (radio). TV advertising also gives a great image for a company as it shows that the company has good funding and is not socially unaccepted. Not only is TV advertising not ‘value for money’ (the cost per one impression is high); the impressions are not mainly car owners living in or around Harrow. Radio is a bit like Television only much cheaper and the advertising type is audio and not visual. Because radio is much cheaper than TV, it is not a must that the majority of listeners are potential customers. Radio advertisements are usually cheaper to create and also to broadcast. Radio is mostly heard by car users who are much more likely to need a garage than people who watch TV. In other words most car users listen to radio but not all TV viewers are car users therefore radio is much more cost-effective at targeting car users because you are paying for less impressions but a higher proportion of the impressions are car users. Like TV, you can also target the audience, for example the radio program ‘Hot Drive Home’ is usually listened to by car users. The average spent on creating a radio advert is 10% of the overall campaign budget, for example a £2,500 that could go on for 4 weeks on a smaller radio station would typically require £250 for creativity but a £250,000 that will go on for a year on a larger radio station would require £25,000 for creativity; for example more than one advert and a jingle so that listeners would remember your name from it. It may also be worth licensing a famous song. My summery is that radio is a good way to advertise in the future when some more capital is generated. The cost is varied with program and station but is estimated at a minimum of £60 for a 25 second advert. It is much cheaper than TV advertising and is more efficient (Errol doesn’t need as much attention because he has a small business) but still cannot be aimed at Harrow. Radio is also more efficient that TV advertising because car owners are usually more to listen to radio and car owners are what Errol Anderson needs to aim his media at. Good impression to listener which meets the aim of a good image of the business. Everyone in London listens to the adverts which make the advertising more expensive even though only people in Harrow are potential customers. This type of media varies in quality and price. Designing a poster isn’t hard or too costly and placing it in shop window will not cost a lot. One could probably negotiate at £10 per week for a poster on a shop window. Advertising on a billboard however is very expensive. It requires a lot of capital and a single-branch business will not benefit from it. A poster on a shop window can inform and persuade. The problem with it is that car drivers will not see it, and it will be mainly seen by passers-by. A billboard advertisement informing the public where the shop is by giving directions from the billboard is a good idea to grab attention. An advert like the above is not effective. Viewers will not know where to get the service from. But one which shows that there is a garage which will install nice gadgets or fix up your car on the next right will be very effective. This however will need a lot of capital. Smaller adverts like on bus stops are much cheaper. McDonalds and other restaurants use it sometimes to show that there is a branch at the next turn, but this is mainly for impressions from walking passers-by and is not effective. As for posters, too many will give a bad name for the company for wasting paper, and being unprofessional like some other cheap advertisers do who put posters on all walls with no license. Leaflets are a common way of fulfilling the aims of starting Errol’s business. It is a cheap way to be known and getting some customers in and out of the business. A big downside is that some people consider this as wasting paper and will cause problems for public relations. However the people who don’t mind will be happy to receive a leaflet because they feel more valued as a customer. Designing a leaflet is not very expensive but the more it is paid towards printing a creating a leaflet, the better the image of the business is portrayed. Leaflets have a lot of space for info, pricing and offered services. Typically, Errol can get 5,000 A5 printed leaflets for £55. The new ‘virtual world’ as some call it has many benefits. One of the keys to business success is IT, partly for marketing. Advertising on the internet is not like advertising elsewhere. To start you must have a website so people can click the advert. Then you need to have a keyword expert to have your website ranked better with the required ‘Google’ searches. For example, if you want your site to appear at the top of the ‘Google’ search for ‘car modding in london’, your density for the words in the site must be strong so ‘Google’s’ system can see you as the appropriate site for the search. It isn’t expensive to host a site on the internet. A small business will probably have a place on the internet from £35 a year but the content needs thinking about. Nowadays, designing a simple site is not rocket science but to create a good image for a site, a designer or at least some sort of consultancy is needed. For search engines, I researched the most searched terms to do with cars and I found that it was ‘car parts’, ‘how to make your car faster’ and ‘car garages in London’. For a site to appear on Google, it doesn’t need money, but quality and other sites linking in. A good way to do this is a method called Link Exchange, where two sites link to each other so when ‘Google’ visits one site it can see the other site and the system sees it as a more important site. Link Exchange is usually free as long as both sites link to each other. As for advertising, it depends on the website, but typically 3p per click that goes through. I found ‘Google Adwords’ very interesting. The above from http://www.google.co.uk/adwords shows where the advert will be places. A good thing about it is that the business decides the keywords and the budget. You decide how much you pay per click (minimum of 3p per click) and the more the value the higher on the advert list it is shown at. Errol will also decide how much to pay maximum per day so it doesn’t go over budget. There is also an option to make the ads display only for visitors in London. I conclude with that a payment of about £400 a year would really improve a company’s image. It can also be used later to integrate with the booking system for car servicing. It is very cost-effective. There is little suspicion that Cinema advertising for this type of business will be no success. It is an overpriced advertising and there is a lack of the targeted audience. Newspaper advertising varies. There are different prices, different location and different types. A good way to advertise Errol Anderson Motors is to place an ad in the local newspaper. This is a much cheaper way to advertise than national newspaper. One of the target audiences for Errol Anderson are people living in the area of the garage, so you would probably meet the target with the same success in both, be. In a local paper, you would only be paying for impressions that would probably meet this target. I asked the Harrow Times how much it would cost for a quarter page 2 colour advert on the motoring section. I was given a quote for £420 per day for the advert. This is a good way to introduce Errol’s business and could be used. Good advantages include that it is being targeted at one area and it is in the motoring section which is where most interested in motoring would turn to. Directory advertising is one of the easiest. ‘Yellow Pages’ claim it is the most used directory in the U.K. offers directory listening from free. An advert like the one below on the Yellow Pages costs £225 per year which is a very good price. The directory is for London only and the ad is conveniently placed in the category of Errol’s choice (i.e. Car Garages) so you are bound to get a lot of impressions from people who are looking for a car repair or modification. The money paid is a very good investment and it is recommended. A drawback is that many other garages also have adverts like this one, so a lot of care needs to be taken in designing this advert. As has been stated before, Yellow Pages offer a very good service and a good investment. An advert of £255 cost will drive many customers. It is a cheap way to get many views throughout a year. It will allow survival as a medium-term campaign and not just a short strong burst. A website will be created because it is an easy way to gain a professional image. To have a website address on posters and listings is a great way to show an established, stable and trust-worthy company. When a website is made, Errol’s business can start to make internet advertising. Instead of a wall poster, persons will be hired to hold a banner on the pavement to get attention of drivers. This will last for only the first few days. Hiring a person to do this for six hours a day would cost about £24 and a poster can be done for £3.99. A simple handwritten or computer designed note at the top with an arrow pointing to the garage. The banner is not to get the attention of drivers but to inform them so it doesn’t need to be flashy. Another person will be hired for the first few days to give leaflets to cars passing by. 5,000 leaflets distributed across 2 or 3 days would cost around £100 but is a good way to start off the business. It is a cheap way to become known and leaflet receivers will feel valued. might want to advertise your product on TV or National newspaper, but might not have the budget, therefore according to your budget you have to select the media to promote your product. Types of media There are many types of media that you can select from in order to promote your product. 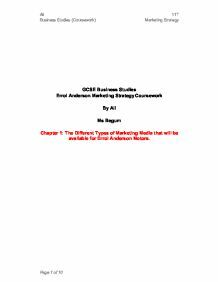 The following is the structure, layout and section summaries for the assignment: Section 1: Meet Assessment Objective 1 Analyse the marketing mix for existing media products The first section will meet Assessment Objective 1 to analyse the marketing mix for existing media products. The lighting used is like a spotlight directly focussing on him, where as the background is the opposite contrast, mostly dark apart from a fire. The boy's wearing bright colours including green, yellow, red and blue. This tells the audience that he is the main person in the picture and must be Carl White. This is evident from the brisk growth in mobile phones and Internet connectivity. Following China from a distance, India is catching up fast on the mobile user base with a burgeoning market. Similarly, user base for broadband internet is on fast growth path.